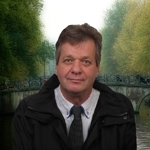 Your Amsterdam Driver Tour Guide and host Hans Langh, owner of Holland Private Tours. – Academy of visual arts, Saint Joost, Breda, Netherlands. Master’s Degree, Visual and Performing Arts. – Hochschule der Künste HdK Berlin, Germany. – Berliner Portrait (Germany since 1945 Through the Eye of Dutch Photographers). – Berlin von aussen. Neue Gesellschaft für bildende Kunst, Berlin, Germany. – Visualiser at Shell Technology Centre Amsterdam. – Graphic Designer and DTP at several of Amsterdam’s advertising agencies. – Career switch into professional traveller for van Nood Travel and Peter Langhout Travel. City trips to London, Paris, Berlin, Brussels and Prague. – Tour Leader Great Amsterdam Excursions Company and Lovers canal cruise company . – Amsterdam driver tour guide. Holland Private Tours. Native Dutch. German, English, Spanish as professional proficiency. Poetry and flowers. Amsterdam, Paris and Berlin. Efsix sailing. Sailing instructor for people with a handicap. Life in the golden age of Holland. Military history of the first and second world war. Amsterdam Jewish history. Tiene mucho tiempo de tránsito. ¿Puedo salir del aeropuerto? En muchos casos se puede salir del aeropuerto. Holland Private Tours le ofrece la posibilidad de realizar una excursión a Amsterdam u otro lugar de interés cerca del aeropuerto durante su tiempo de tránsito. No obstante, no siempre está permitido salir de la zona tras los controles de pasaportes. En algunos casos se requiere un visado. Infórmese bien de los requisitos antes de viajar. Amsterdam Stadtführungen auch auf Deutsch. Ihr Guide kombinierte nach seinem Studium an der Berliner Hochschule der Künste, sein persönliches Interesse in Kunst, Geschichte und Architektur miteinander im Bereich Tourismus. Prive Tours voor uw buitenlandse gasten, vanaf Schiphol of hotel. Als incentive om uw gasten op een aangename manier kennis te laten maken met Amsterdam en Nederland.